If drinking coffee is so popular nowadays, it is certainly due to the fact that people love and crave this beverage. How many important meetings have been held over a cup of coffee? How many business or working agreements have been entered into and signed while sipping an espresso? Over the years, another trend has developed in addition to drinking an espresso at the bar and making moka pot coffee: domestic espresso machines are very common nowadays, along with coffee capsules and coffee pods. 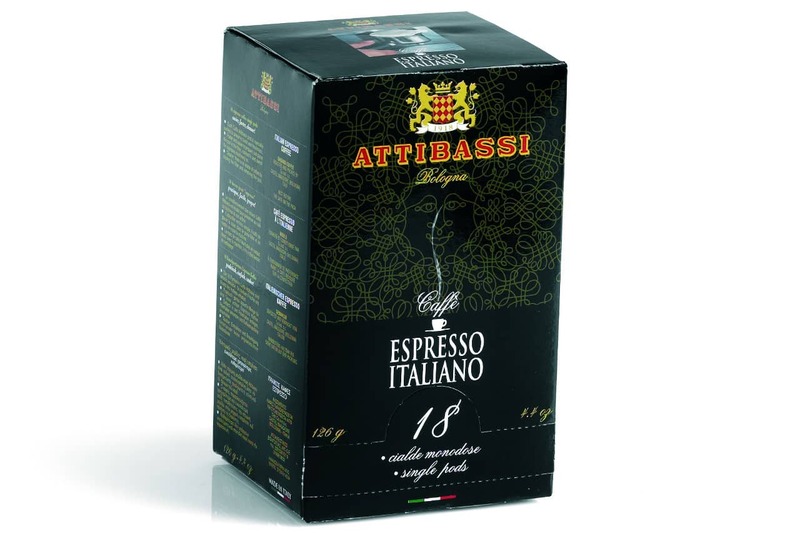 Attibassi has designed the Espresso Italiano pods to meet the most popular customer preferences. Thanks to the use of carefully selected materials and premium coffee blends, the Attibassi coffee pods offer the best solution to extract a perfect espresso at all times. The portioned coffee market has experienced such a boom that it has gone from being a niche market to the fastest-growing segment in the coffee industry. The turnover of this industry has already reached one billion Euros and sales volumes have grown exponentially over the years, reaching +20% in particularly favourable years. Was it a predictable change? Yes, probably. Since coffee capsules and pods are a quick and convenient way for consumers to brew an espresso and to enjoy drinking coffee at home, it is no surprise that they have taken over the market. Those involved in coffee pod wholesale or retail are well aware of another advantage of this format: the coffee machines used. One of the most appreciated aspects of ESE pods is that they are fully interchangeable and have a universal format. In fact, the acronym “ESE” stands for Easy Serving Espresso, an open system that was created to establish standard sizes for defining a common format for manufacturers. What does it mean in practical terms? This means that, regardless of which coffee machine you choose to purchase, you will be able to enjoy an excellent espresso with the Attibassi coffee pods, without having to worry about buying a compatible machine, as in the case of coffee capsules. While this allows consumers to save money and have a potentially endless choice, it is also a strong incentive for producers to achieve high production quality. In fact, although many think that coffee pods are a second-class product, they are now attracting greater interest with increasingly demanding and informed consumers, who are able to tell the difference between a quality product and a mediocre attempt. Quality is thus the beacon that guides Attibassi in producing coffee pods. From coffee, specially ground to offer a fine product and ensure optimal extraction using a coffee machine, to meticulous wrapping and packaging in a box or pack, so as to meet the needs of those who want to have a small supply and of those who prefer to have a bigger supply in order to make sure they never run out. Convenient, single-serving paper coffee pods to easily make an excellent espresso. Each pod is individually packed in a protected atmosphere and contains the exact dose of coffee, i.e. 7 grams, properly pressed. The tab makes it easier to grab while ensuring maximum hygiene. Convenient, single-serving paper coffee pods with 7 grams of powder. 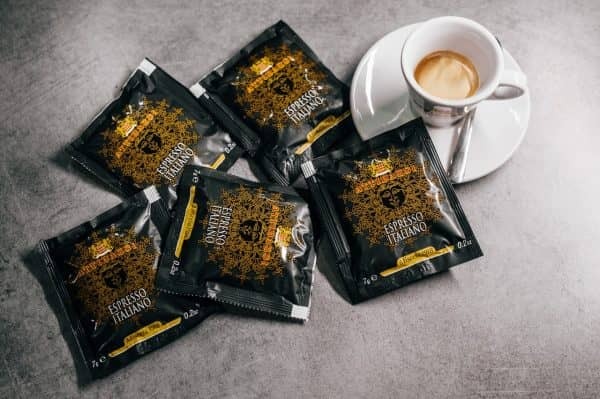 With these pods you can easily obtain a perfect decaffeinated espresso, thanks to an accurate selection of the coffee beans used in the blend and to the roasting process, which preserve the taste and aroma of a classic coffee. As required by Italian regulations, Attibassi’s decaffeinated blend may not contain more than 0.1% of caffeine per cup. Attibassi’s decaffeinated pods are available in a pack of 150 pods. Creating these two products is neither simple nor obvious, but requires attention and care down to the smallest detail. As mentioned previously, each pod contains 7 grams of coffee. Will this coffee be as good as my moka pot coffee, or will I be drinking a concentrate with an indefinable taste? It is a legitimate and necessary question. Contrary to what one might think at first, it is important for consumers to raise such doubts. This exact question is what encourages them to try new products, to have doubts on the products they usually buy and to always look for the offer that ensures the best possible quality. We are Italian. We are very susceptible about coffee. This is why each of our coffee pods is individually packed with the right amount of product and hermetically sealed, in order to always guarantee a thick cream, the right colour and the best taste at each extraction. Although pods and capsules are often related and even confused with each other, there are differences and it is best to know them, so that you can fully appreciate them and choose the format that suits you best. As far as pod coverings are concerned, the materials used need to be of the highest quality. Coffee percolation, i.e. the method used to extract coffee from pods or capsules, is a very aggressive process and requires the use of filters designed to withstand high temperatures. In fact, during extraction, water passes through the powder at a temperature of 90°C, and it is therefore important to use vegetable paper filters that will not deteriorate or leave residues in the extract. The positive aspect of this process lies in the disposal of used pods, which can be disposed of easily in organic waste bins, since they basically consist of vegetable paper and coffee grounds. This means that they are completely eco-sustainable, unlike capsule components that have to be separated by consumers. However, this problem can be solved by using biodegradable capsules, i.e. special capsules that are also made of completely eco-sustainable materials. Price is another aspect that goes in favour of pods. In fact, pods are often cheaper than capsules, which are made from more expensive materials such as aluminium or plastic. Yet, coffee machines are designed to be used for either pods or capsules. Compared to the first models, which were bulky and not very stylish, as all prototypes are, coffee machines have become design items designed to complement kitchen furniture and are available in many variants, each one suited to a different environment and style. Therefore, consumers don’t need to choose a specific type of coffee machine. This freedom of choice should encourage companies operating in the coffee market to constantly offer products with very high and satisfactory standards. we produce the best coffee, because we want to drink the best coffee. If the Attibassi brand, story and quality appeal to you and you, don’t hesitate to contact our team to join us as an official supplier of our products. Coffee bars around the world use the Unique Attibassi blend. Find the closest to you. Attibassi: the pleasure of tasting the perfect coffee.